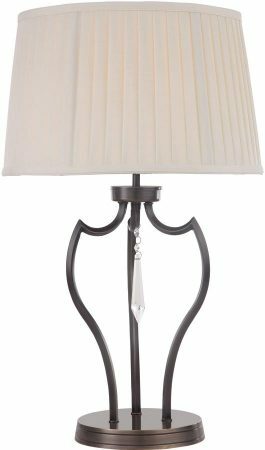 The Elstead Pimlico solid brass table lamp in dark bronze finish with ivory lamp shade is manufactured from square section tube, with a sturdy base, open body and cut-glass central drop to complement the finish. Supplied with a quality 14″ pleated fabric shade. This luxurious table light is supplied by Elstead Lighting, a British company that specialise in the manufacture and distribution of quality decorative lighting such as the Pimlico solid brass table lamp in dark bronze finish with ivory lamp shade you see here.